The next step is to replace it with a Clapp oscillator - then the frequency and amplitude are better decoupled from each other and potentiometer adjustment is almost independent. Try to use a bipolar transistor. Now I have gained some experience and observations how the temperature drift of the oscillators is. Not surprisingly, air coils have the lowest drift in inductance and so they are to be prefered. Also the use of a variable air condensor is better for stable tuning. The task that you need to solve is finding the resulting capacitance that belongs to the two ends of the oscillating coil. Thus you have in practice serial and parallel capacitors and a bit math to sum them correctly. The main temperature critical capacitances comes from inner ones of the transistor used for the oscillator. Two dependencies are important: temperature and voltage. 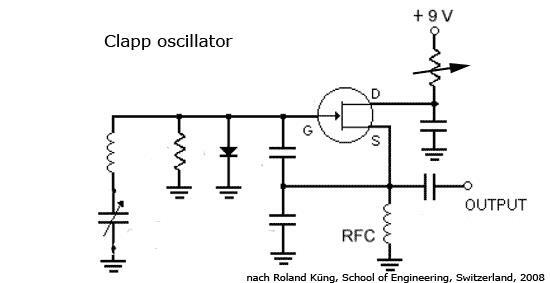 With respect to my simple colpitts oscillator for the volume control with jFet it is clear, that a replacing of the coil by coil plus capacitor (Clapp oscillator) reduces the influence of the transistor capacitances. But frequency and amplitude control are still not independent, the temperature behaviour is not yet in the range I wanted to reach, so I will try another way. One important point with the Clapp oscillator is the choc coil. It provide the DC return path and the RF load of the oscillator. According to "An LC Oscillator of Unusal Stability" by Clapp himself, that coil should be capacitive at the operating frequency. That coil is in parallel with one of the coupling capacitors. In my DIY Theremin, I used a 10 mm section of a piece of wood of 10mm in diameter. The result is several layers which provide a higher capacitance than if it was made of a single and longer layer. From my experience, the quality of the coupling capacitor in parallel with that coil is very important. The lower the Q of that cap, the lower the oscillating voltage. The transconductance of the active part have the same effect. The exact value of the coupling caps was determined first by a repetitive and recursive SPICE simulation which took 2 days to run and resulted into a nice movie, and after that practically by using a variable air tuning capacitor for each of the coupling caps, in order to determine their values, that for all 3 oscillators as they don't have exactly the same implementation in my design. For the temperature behaviour, the Black Star is playable from the start, but the null need to be adjusted several times under the first 15 to 20 minutes of operation. To stabilize completely, it take between 1 to 2 hours of operation. After that, the long term drift is non discernable with my instrumentation or when playing. It is also the Franklin oscillator. It use 2 active parts and can be made more stable than a quartz oscillator, that because of all LC oscillators, it is the one that have the lightest coupling on the LC tank. But I didn't experimented with it. I think it would be an overkill for a theremin, but who knows? It can be of use in order to measure the temperature drift of the LC tank. It is possible with it to use coaxial cables between the LC tank and the oscillator, which imply it is possible to put the LC tank into a regulated owen in order to archive extreme temperature stability, or to measure the temperature drift of the LC, which when known, can be compensated with a negative temp coefficient condensator. Now I reduced the volume control circuit ones more and use now a resonator instead a coil for the Clapp oscillator. So the frequency is very constant with respect to the amplitude of oscillation. Q of the whole filter curve is about 50. A trimmer is inserted for tuning the antenna resonance. Which of these tuning schemes was more convenient? How has the sensitivity changed? What are you planning to do next? The difference between dynamics and sensitivity compared to the older version with Colpitts oscillator is low, but the temperature stability is here with clapp oscillator using ceramic resonator much better. As a next step, I would like to proofe if the use of the potentiometer on the oscillator amplitude is better suited to adjust the sensitivity, or a potentiometer in the buffer part. Some measurements will done soon. Modifications have been made to the volume control, such as an amplifier stage after the jFET voltage dividers. The bandwith of the filter unit seemed to be too narrow, so a proper resistor is used parallel to the trimmer capacitor. Sensitivity is adjustable after the 39 k resistor has been replaced by a potentiometer. So adjustment knob is now in the a.f. part. Some initial tests are performed with a plate antenna that has the same static capacitance as the loop antenna. It is not easy to hold one's hand still and make measurements at the same time! The most common curve is similar to the over the distance stretched green one. Now I've tried to implement attack-release capabilities. The idea is reliable feedback to vary the Q value of the filter. First results can be seen here. The second three tones are with such feedback. It sounds a bit like "bloon" instead of "joon". The up and down of the hand movement is slow and at the same speeds. Even single notes can be played sharply separated without glissando. However, the goal is not ADSR, which could always be done with external modules. I want to find the key to a "velocity feedback". That is, only when the hand moves short and fast, a strong attack is executed, otherwise the signal remains unchanged. I think the ingenious subscope theremins do such a job. Here is a very useful explanation by Carolina Eyck of the various tone dynamics possible due to the hand movements. I should take this more into account.